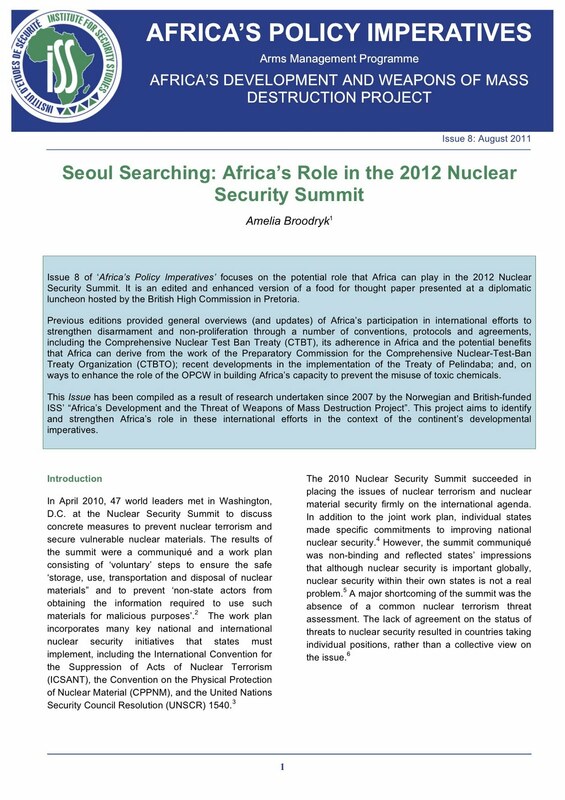 Issue 8 of ‘Africa’s Policy Imperatives’ focuses on the potential role that Africa can play in the 2012 Nuclear Security Summit. It is an edited and enhanced version of a food for thought paper presented at a diplomatic luncheon hosted by the British High Commission in Pretoria. Previous editions provided general overviews (and updates) of Africa’s participation in international efforts to strengthen disarmament and non-proliferation through a number of conventions, protocols and agreements, including the Comprehensive Nuclear Test Ban Treaty (CTBT), its adherence in Africa and the potential benefits that Africa can derive from the work of the Preparatory Commission for the Comprehensive Nuclear-Test-Ban Treaty Organization (CTBTO); recent developments in the implementation of the Treaty of Pelindaba; and, on ways to enhance the role of the OPCW in building Africa’s capacity to prevent the misuse of toxic chemicals. This Issue has been compiled as a result of research undertaken since 2007 by the Norwegian and British-funded ISS’ “Africa’s Development and the Threat of Weapons of Mass Destruction Project”. This project aims to identify and strengthen Africa’s role in these international efforts in the context of the continent’s developmental imperatives.